The ultimate two-speed transmission for competition robots, enabling seamless "on-the-fly" shifting in a compact, light and easy to maintain package. Three different gearbox ratio options enable maximum versatility. The 2 CIM Ball Shifter is the ultimate solution for a two-speed transmission in a competition robot, enabling seamless "on-the-fly" shifting in a compact, light, and easy to maintain package. Three carefully selected ratio options allow for maximum versatility. Every aspect of this transmission was designed with size in mind. The 2 CIM Ball Shifter puts a 2-speed transmission into a tiny, lightweight form factor. The ball lock shifting method reduces the gap between the two gear reductions and allows for an extremely narrow assembly. The gear reductions were specifically chosen to reduce the overall transmission size and complexity. Highly efficient due to the AGMA 11 quality gears with teflon infused ceramic coating. The 2.27x spread between low and high gears in the VEXpro 2 CIM Ball Shifter was specifically chosen to serve the needs of FRC designers. When designing an FRC drivetrain, teams typically try to ensure that the robot low-gear can survive a continuous pushing match (with high traction wheels) without tripping breakers. They then choose a high-gear which is "fast" enough to zip around the field, without being uncontrollable or accelerating too slowly. After doing detailed market research, we learned that many teams have found themselves frustrated and limited by the typical spreads found in some of the "off the shelf" shifters on the market. When their low-gear is at the right speed, the high-gear is too fast, or when their high-gear is in the right spot their low-gear is too slow. Not anymore; this shifter is right where FRC robots need it to be. Encoder output spins at 3x the speed of the 2 CIM Ball Shifter output shaft. 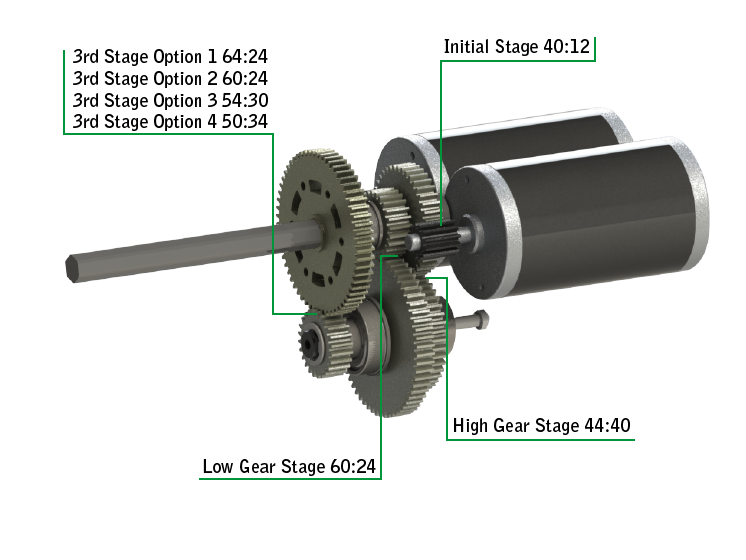 The gear ratio is 36:12 between the encoder and shaft. (1) Flanged Bearing - 3/4" x 1 3/8" x .437"